The Seahawks disastrous 0-2 start is now a long-forgotten memory. They soared to their fourth victory in five games with a 28-14 win over the Detroit Lions at Ford Field. They now improve their standing to 4-3. The addition of New York Giants notorious run stuffer Damon Harrison earlier in the week to the Lions defense was not enough to halt the Seahawks run game. Their dogged determination to stick to the run saw the Lions defense to start crumbling under the relentless pressure from running back Chis Carson, who featured as the main running back for this game. Despite a slightly stuttering start, his determination and a will of iron saw him continue to dig away at the Lions defense for the duration of the game. 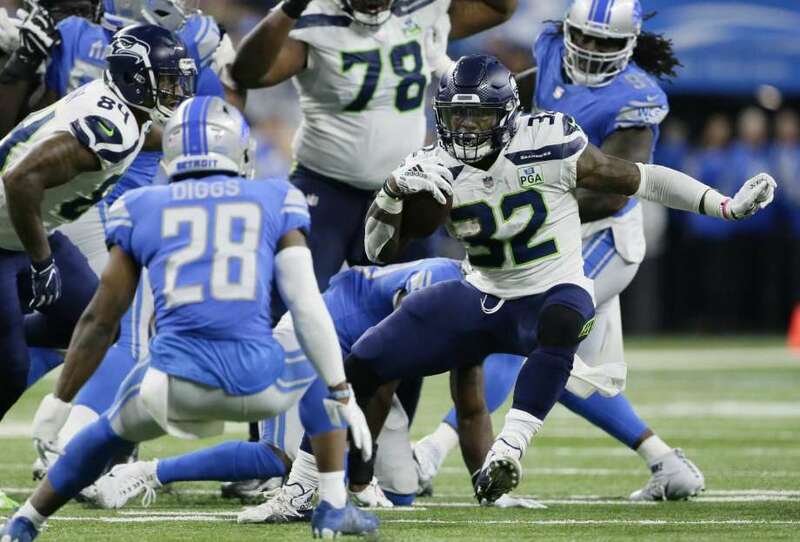 A pointless first quarter for the Seahawks saw the Lions take advantage of a slip up in defensive coverage by Tedric Thompson that gave Lions wide receiver Marvin Jones the chance to get behind him to catch a 39-yard pass to give the Lions the early lead. With such a run heavy offense, Wilson hasn’t been required to pass as much this season. During this game he only passed 17 times, first finding Tyler Lockett for a 24-yard touchdown pass to equal the score to 7-7. He then subsequently found David Moore for a juggling 15-yard pass that gave the Seahawks their third touchdown of the day, extending their lead to 21-7. Wilson would end the day with 14 completed passes for a total of 248 yards, resulting in the 3 pass touchdowns and providing him with a perfect 158.3 pass rating, becoming the first franchise quarterback to achieve that grade. Former Lions tight end Ed Dickson was able to finally make his debut after an injury saw him sidelined for the first 6 weeks of the season. He had an impressive first showing for the Seahawks with 2 receptions for 54 yards and hauled in a 12-yard pass to extend their lead to 21-7. David Moore then made an incredible 45 yard catch to set up a 7 yard rushing touchdown for Chris Carson, putting the Seahawks comfortably ahead at 28-7. The Seahawks defense were performing at a high standard again, sacking Matthew Stafford three times and tackled thirteen times for a loss of yardage. They kept the Lions biggest threat, running back Kerryon Johnson, contained throughout the game. He was only able to put up 27 yards on 9 carries. Instead, Matthew Stafford had to rely on Marvin Jones again to bring home a second touchdown for the Lions, making the scoreline a little more respectable at 28-14. The Seahawks never seemed to be in any real danger of losing this game, though. They managed to control the game to their advantage and contain the Lions offense. The run defense continued to suffer multiple problems with an aggressive Seahawks offense that only continued to thrive the more the game went on. A questionable pass interference call on Seahawks Bradley McDougald probably gave the Lions their best chance of clawing their way back into the game but Justin Coleman’s interception of the pass by Matthew Stafford at the goal line cemented the fact that this game was effectively over for the Lions. The Seahawks were able to close the game with a 28-14 win over Detroit. The Seahawks will return home to CenturyLink field next week as the Los Angeles Chargers and Phillip Rivers roll into town, coming off a four game winning streak. One thing is for sure, though, with the Seahawks defense and offense all performing to a high standard, this is a team that should be considered a strong contender for the playoffs.